The first mention of a castle on this site dates back to a document from 1255. Today’s structure dates from 1680 when Andreas Gottlieb von Bernstorff took possession of the property. From an illustrious Danish-German family, he became the prime minister of the Electorate of Hanover from 1709-1714 and later accompanied George I to England where the latter was later crowned king. Gottlieb von Bernstorff stayed on and became head of the German chancery in London from 1714-1723. 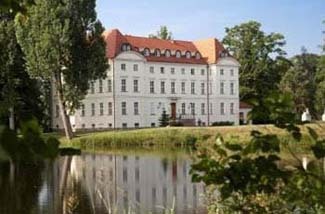 In 1805, the castle was rebuilt in a three-story neo-classical style. Interiors were designed by one Giuseppe Anselmo Pellicia in a “Pompeian style,” so named because the excavations of Pompeii in Italy were popular at the time. You can see thirteen of his ceiling frescos in the hotel. In 1945, the state confiscated the property, eventually turning it into a school. Katharina Haupt-Bernreider acquired ownership and carried out major renovation work to turn it into a lovely castle hotel. You’ll definitely need a car to visit Wedendorf. Take a few days to enjoy the rural charm, or make the castle a base from which to visit Lübeck, Wismar, and Schwerin. From Hamburg and Lübeck: Take the A20 to Schönberg exit, and the B104 towards Schwerin Rehna. Left at traffic light to Grevesmühlen, left again. There’s no mistaking this splendid palatial structure from the distance. It’s impressive rural setting along a lake and beside sweeping lawns is welcoming and peaceful. The feeling here is more of an elegant country house hotel rather than a grand castle. It’s the kind of place where you stroll about the countryside and then come back to grab a book from the hotel’s library and find a quiet corner to read in. Public rooms are large with wood floors and painted ceilings. Tastefully decorated guest rooms are also spacious. Be aware that double rooms have either a bath or shower, not both. The suites have great views of the lake and park. Their “Pompeian style” ceiling paintings are wonderful. Bathrooms in the suites feature both baths and showers. For those on a more modest budget, during the regular season rooms in the stables are offered for a reduced price. The stables are just 50 meters away from the main house, through the park. The hotel serves dinner in a wine cellar, or if the weather is fine, outside on the terrace overlooking the park and lake. Meals are from a fixed three-course menu, with very limited a la carte options.